What started as a simple blog post about my take on sleep and how I wake myself up in the morning, along with a simple desire to garner a little bit of web site traffic and attention through a submission to digg.com, has turned out more successful than I ever would have thought. 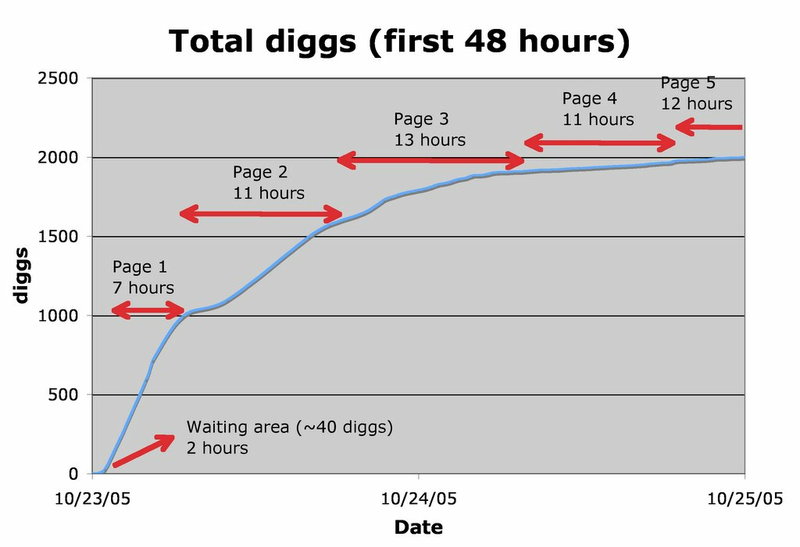 To date, I've gotten 2,300 digs (26th most dugg article this year), over 45,000 hits, almost 500 del.icio.us bookmarks, a mention on the 18th Diggnation podcast, and almost 150 links to my post. All this seems a little absurd for a blog post by some random guy. Jump to the end of this post for a detailed look at the web traffic that digg caused. So why did a blog post get this much attention? 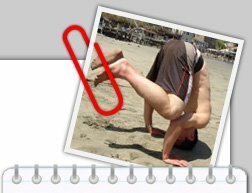 There are thousands of blog posts each day, why this one? For one, I submitted it to digg and people "dugg" it. But how did a blog post neither about news nor technology get on a "technology news" website? My story doesn't once mention Google, Microsoft, Apple, Linux, digg, or Slashdot (typical of dig stories). Alarm clocks can hardly be called technology. So seriously, why did anyone pay attention to my blog? "This is a blog, marked as LAME." Nope because unlike other blogs this is orginal content not some douche linking to another site with a single sentence saying "Click this link to see the doucheyness I found at douche.com"
Many blogs just link to something else or regurgitate material. Conversely, I don't use my blog to just link to other stories. If I want to bookmark something or tell someone that I found something interesting, I use del.icio.us. I use my blog to rant about whatever I see fit and sometimes I gather up my thoughts sufficiently to write something almost comprehensible in an attempt to share what limited knowledge I have. Of course, I don't have enough material on any one topic to rationalize an entire website to it, so that's why I just mash it all together in my blog… amateur writing and random organizational skills at its best. My story was about sleep. What could be more ubiquitous than sleep? Aside from the crazies who claim to never sleep, my story potentially affects everyone; crossing all types of boundaries – gender, race, nationality, age, sexual orientation, knowledge, intelligence, education, interests, geekiness, l33tness, social status, appearance, fitness, and wealth. The vast majority of people that have Internet access have to, at some point or another, wake up at a specific time, whether to go to school or work, get to an appointment, run an errand, or make it to the airport for a flight. We are all slaves of the clock. The title, "Alarm clocks are bad" catches peoples' eyes because of their ubiquitous use and the shocking statement that what they're using could be bad for them. Many people are also sleep deprived and wake up grumpy and feeling horrible. "Wake up and feel better" gives them hope that they can improve their lives. People love self-help. Why wouldn't you want to improve your own life? The problem is that people want change, but they don't want to change. Ultimately, people want results without the price – no effort, cost, or change in lifestyle. What I offered was a "free lunch" – the potential to feel better, maybe have more energy, all without having to spend money, go to the gym, change your diet, or change what time you go to sleep. All you had to do was change what you did with your existing alarm clock. Simple. Effective (?). Free. I started the post by offering some very general and basic science about the sleep cycle. Many people may not have been familiar with it, for the rest, a brief refresher didn't hurt. This helped to meld in the readers' mind the basic premise that my system was based upon; a system that would then seem sensible, reasonable, and had a shot at working. I referred to two commercial products that worked on this basis of the sleep cycle and targeting when you wake up. But of course, people want self-help for free. I offered similar results without the cost, humility, or hassle of having to use these products. I gave no evidence that it works aside from my own anecdotal evidence from the past 7 years. I was however, later backed up by a number of readers who had been doing something similar and those that actually tried it out for themselves. The ironic thing is that while my non-news story was submitted to a "news" site, it is its lack of "news" which may have helped it succeed. People don't bookmark news, or at least I don't bookmark news stories. What's the point of reading old news that you've already read? People bookmark things that they will want to refer back to at some point. Self-help is exactly the kind of material that people would want to save. Approximately 1 out of 90 unique visitors that viewed my post bookmarked to their del.icio.us page, for a total of almost 500 del.icio.us bookmarks. I think that's a fantastically high number. 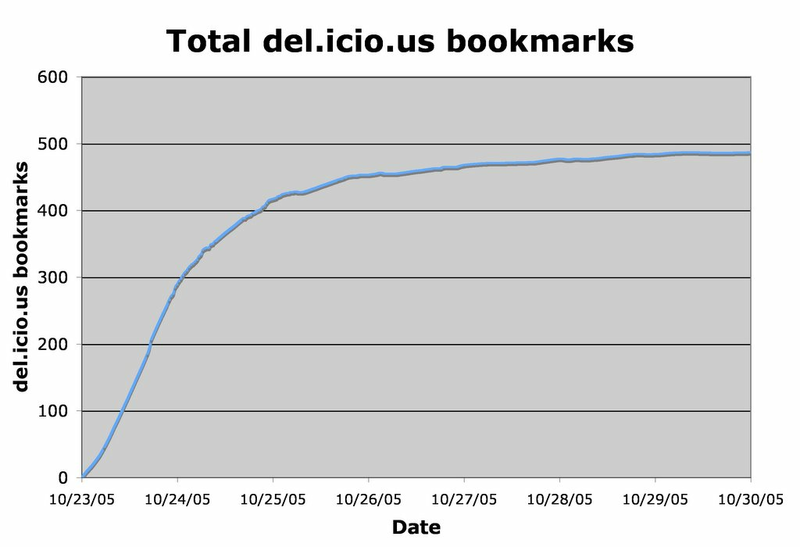 Considering that relatively few people use del.icio.us (although my traffic would have definitely been skewed towards the technologically adept crowd), I must have had a few thousand regular bookmarks. That's incredible to me that anyone would save my page, let alone hundreds or thousands. 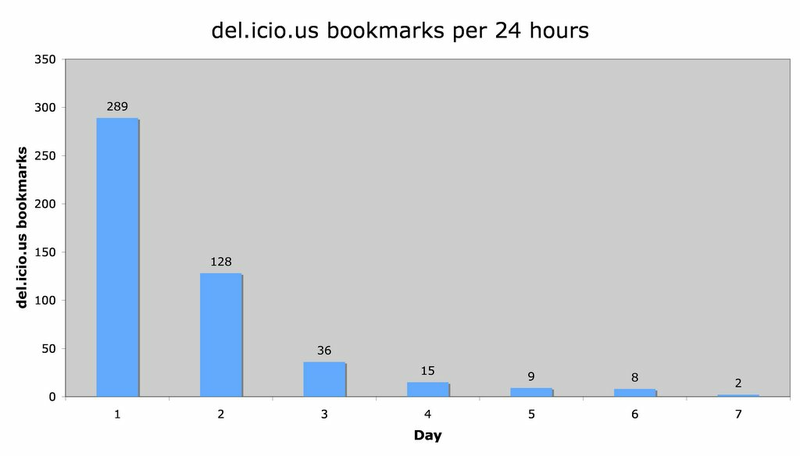 The number of del.icio.us bookmarks made my post the most popular bookmark for a short period and in the second spot for a good day. This in turn, gave me more hits. The kind of post that mine was, also lent itself to be told to others by word of mouth, hence my almost 150 links (according to Technorati) from other blogs and webpages. Who knows how many e-mails were sent (at least a couple as I saw some hits from gmail, yahoo mail, hotmail, and aol mail). Word of mouth is a powerful thing. That's very much how digg works. This was not an attempt to write a guide about how to get your blog on digg and get a lot of diggs and hits. I doubt the repeatability of this even for myself, at least on a grand scale of which it happened this time. I'll be the first to admit that I'm a one hit wonder. I would say that original content on blogs will get you more traffic than just links to other webpages. Blogs can serve as an outlet for amateurs to present to the world some novel material. How to get the world to read about your fantastic post is the difficult part. 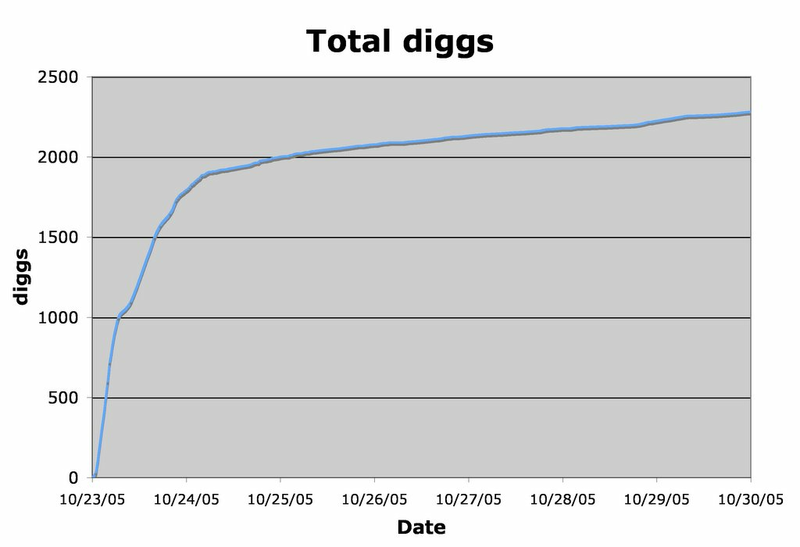 For me, I found digg to be quite successful, but your mileage may vary. 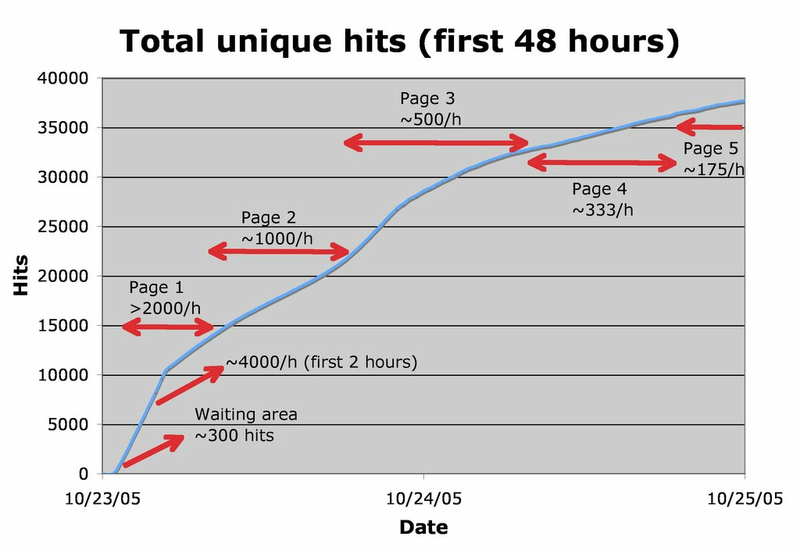 In comparing Slashdot and digg, introducing new content was something that came up. Maybe blog posts is part of the solution. 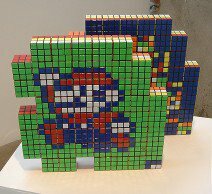 C'mon this is friggin' awesome! I had no idea that my post would be as successful or as well accepted as it has been. My intentions were to get a bit more traffic to my recently reincarnated blog. I hoped for maybe a few hundred diggs and a couple thousand hits. I got an order of magnitude higher than my highest expectation. The thing that caught me off guard was that people were actually bookmarking my page and linking to my post. 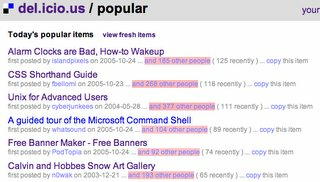 At one point, I was the most popular bookmarked site on del.icio.us. Approximately 1 out of 90 unique visitors were bookmarking my post on del.icio.us. I don't know what the typical numbers are, but I thought that this was quite high considering the relatively few people that use del.icio.us. Without further ado, here are the rough numbers during this whole fiasco. 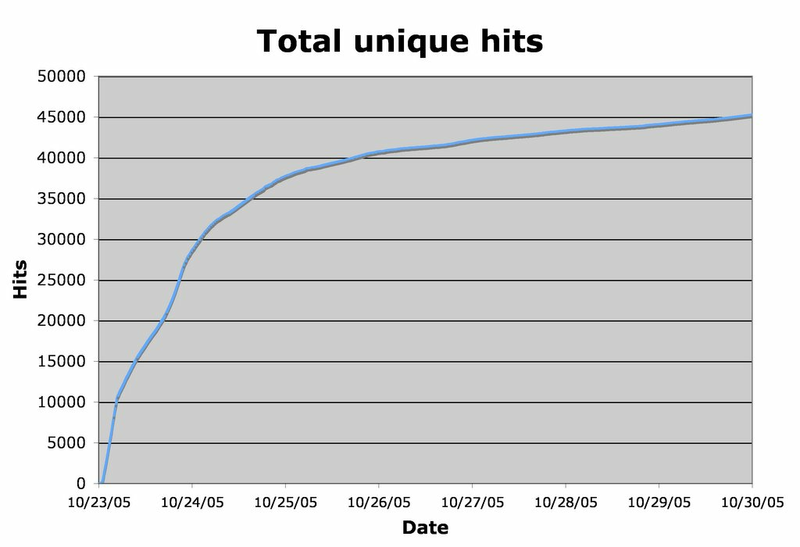 I submitted to digg on Sunday, Oct. 23, 2005, at about 5 pm (PST), so all the following data considers this as time "0". The stats for the first little bit are a little rough, as I wasn't tracking the stats very carefully at the time and I was out playing volleyball. For all intensive purposes, my blog didn't get any traffic before. 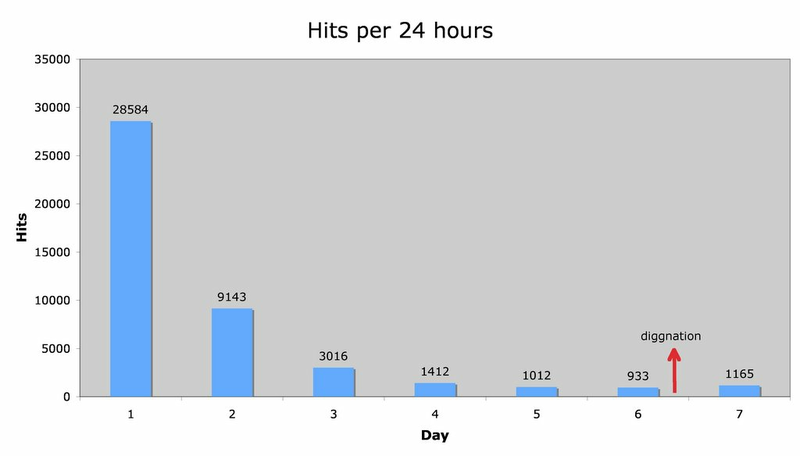 Here's the total number of diggs and hits that I got in the first 48 hours. Things obviously slow down the further you are from the front page. It's a shame my post was on the front page for such a short amount of time. Things really start to crawl after 24 hours. I hit exactly 2000 diggs after 48 hours. Here are the total number of diggs, hits, and del.icio.us bookmarks my post got over the first week. Initially, all my traffic was coming directly from digg. After about 12 hours, I was already on page 2 of digg, but I was getting about 10 – 15% of my traffic from del.icio.us's popular page. After a brief stint at the top, I was delegated to 2nd for the good day before dropping like a rock and falling off the popular list. 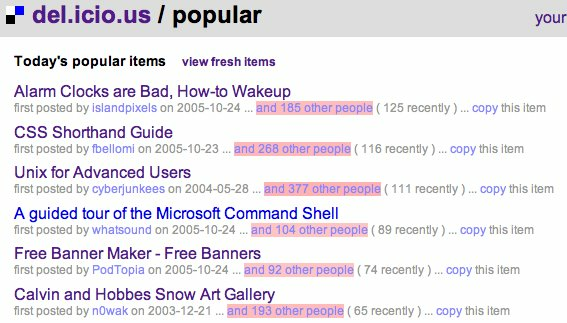 del.icio.us itself has it's own snowball effect since other sites create their own lists based upon del.icio.us bookmarks, such as populicio.us, LiveMarks, Daily Mashup, and Spiderous. del.icio.us copycats, such as Spurl and Furl, also helped to spread the word about my post, but only had a fraction of the impact that del.icio.us had. With word spreading around the Internet, other places began to link to me and also served served as sources of traffic (the snowball effect). Some of these places gave upwards of 20% of my traffic at times. I would like to thank digg and all the diggers out there. I appreciate all the comments that people have left me both here and on digg. All I wanted was to share some information and if people found it useful, then that's absolutely fantastic. And lastly, I would like to thank you if you've made it all the way down to the end of this post. I actually heard about your blog on Diggnation podcast during a flight (i don't know if it is danggerous to listen to an ipod on a plane, but whatever) as soon a i got back on land i hook-up to the internet and dugg your story, i'm heading to try your system... i hope it works. Rock on, random guy. Rock on. It's blogs like this one, with their decent worth-reading content, that keep the entire blog thing worth doing. I'll throw your feed into Sage and check in once in a while. great post... much more informative even than the first one that got on digg. dude i think it's because whoever was listening to the diggnation podcast went to check you out, because the alex didn't even read the digg story about this, or he forget, so he paraphrased it and nobody knew what the story was about. Kevin Rose is so CUTE! How can I get people to my blog and be famous like you? hey -- jimmy and i gave this site traffic before all this hoopla. The CAPTCHAs aren't getting harder, you're just getting dumber, and they're not getting longer, you're just losing your endurance. Too bad you didn't have AdSense, you could've made some cash. I am amazed that you didn't get flamed out of existance. I gave up on DIGG for a while because of nasty flames from dweebs with nothing better to do than gripe about stories submitted to digg. 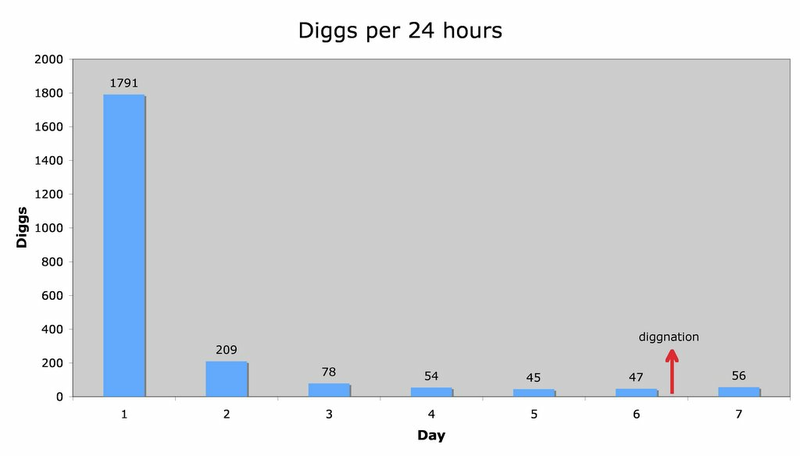 After my pitty party, I still don't use digg that much. geoff: I thought about putting adsense on my page, but the whole thing with ads on a blog is so cheesy and what, it would've gotten me like $5? Crusaderx: ya, I'm quite surprised too that people didn't flame me. Even more surprising is that some people actually defended me on the digg comments, and I don't even know them! Hi, pretty interesting article. Curiously, starting from here, I found myselft doing the Polyphasic Sleep (also known as Uberman Sleep), your article was pointing at this topic, and soon enough I was already doing it. OK so now for the greedy question. I apologize if this has already been asked. But I barely had enough attention span to read both articles let alone all of the comments. Why don't you have Adsense on your blog so you could have profited from this? Or better yet, did you profit from this in some other way? May I suggest reading Malcolm Gladwell's "The Tipping Point". Sure you have heard of it. It may add some light to your already interesting analysis. I found your Alarm Clocks post when googling "slept through alarm why" (I was sheepish at searching the phrase "Why do I sleep through the alarm clock?" due to a mild, temporary, & irrational fear that my search history would one day be public a la the aol-scandal). I found your post as I was looking for alarm clocks online. Because I read it, I ended up purchasing an inexpensive clock radio/dual alarm. Very persuasive and smart posting! You know why it was so popular? Not because any of the above bullet-points. No, but because it was freakin' genius! 7 years from your original post, and people like me still manage to stumble across it and find truly great advice.